A teacher comes alongside and informally talks with a child to accomplish purposeful learning, directing the child's thoughts from his/her current experience or activity to God and His Word. Are these teachable moments being used effectively? Who is God? - The questions kids ask about God-and how to respond. 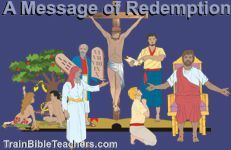 Jesus' approach differed with the children than how He ministered with adults. He did not gather them round and lecture them. He called them to Himself and blessed them, holding them. Though Scripture does not say Jesus got down on their level and into their world, it does express His delight in and love for them. Jesus does communicate their worth and the need for input into their lives. This 55 page teacher training show how guided conversation fulfills this purpose. God is not far away but to children it may seem like He is. Bible teachers can help bridge the distance by using Guided Conversation. This 2 page teacher training worksheet focuses in on the word "GUIDED" as this methodology is conversation that guides a child to God.